If you are here for the ‘Tangle Starts Planner’ giveaway, you can find it here. 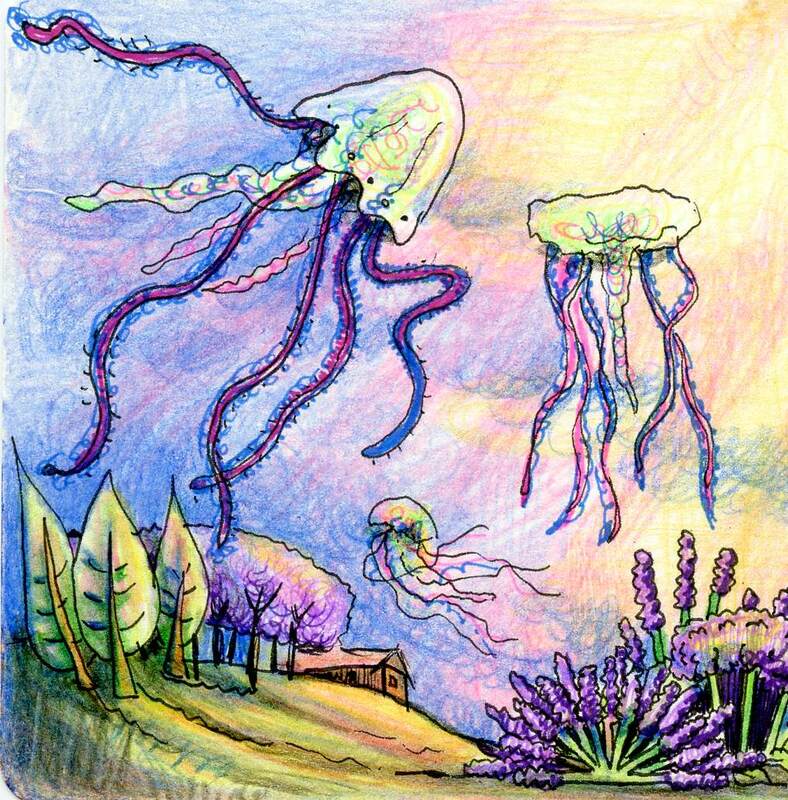 The Friday Fun & Easy Challenge for 1/19/18 – 1/25/18 is to draw a landscape using the Jellyfish step-out. Calorie-free brownie points for adding a lavender plant or two! 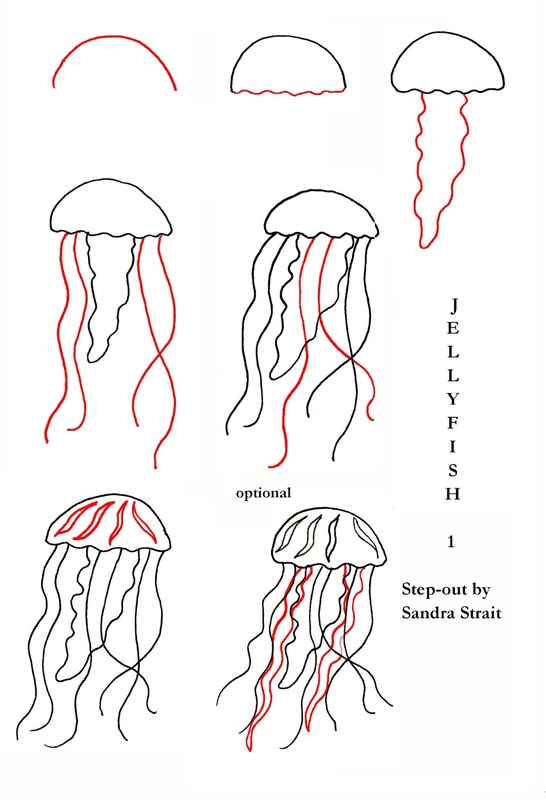 Jellyfish are pretty easy. They consist of three types of shapes. To keep things simple, I’ll call these a head, tail(s) and tentacles. The head can be shaped like a half-circle, a bullet, a square – almost any shape you can think of really. Different species have different shaped heads, and the shape changes as the fish swims through the water. The tail is sort of like a mass of spilled jelly hanging from the center. Some species have more than one tail and they can vary in length and thickness. The tentacles are long whip-like… well… tentacles! I’ve simply used squiggly lines to represent them, but they could be thicker if you wanted to add more interest to the drawing. Don’t sweat any of the shapes or the direction that the tails and tentacles go. Jellyfish are constantly in movement and all their parts go all over the place. This example done with Da Vinci watercolor in a Hahnemühle Watercolor Book. …but Fun & Easy Landscapes are meant to reflect your fantasy world. 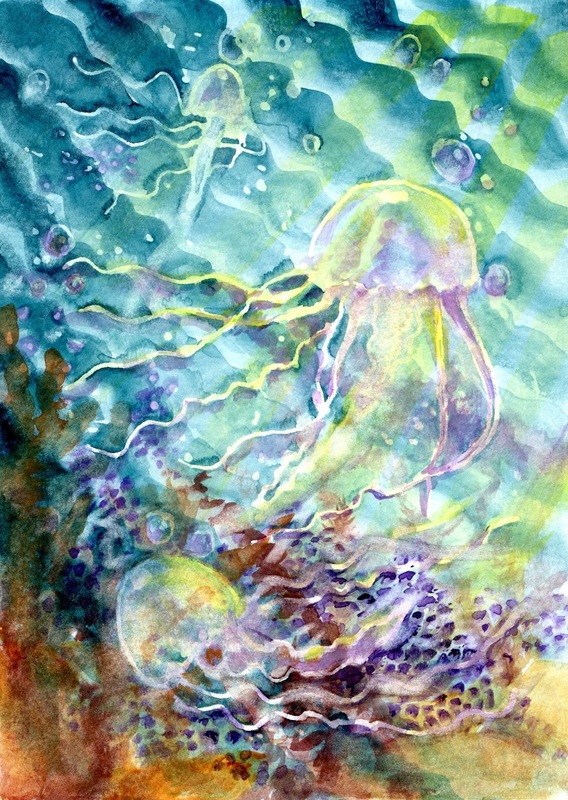 In mine, Jellyfish can live on land, floating through the sky like huge bubbles. They are nocturnal and trained to be attack fish, stinging evil-doers with a mild toxin that will immobilize them until the police arrive. Yeah! There’s very little crime in my fantasy world. Zensations Mechanical Colored Pencils on a Hahnemühle YouTangle.Art tile.